Teammates, originally uploaded by The Bacher Family. As a photographer, you always have to be looking for a shot. 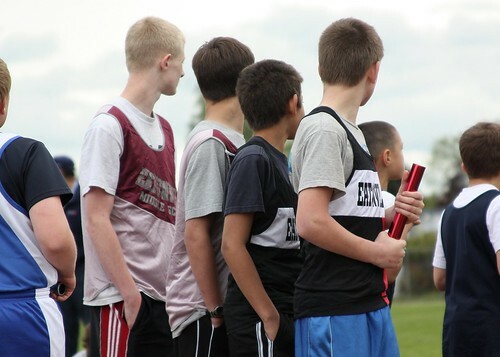 I had my camera at the ready, waiting for the 4x100m relay to begin, when I noticed these four guys standing in a row looking like four peas in a pod, all of them with their hands in the pockets (or gripping the baton), all turned the same way, all with the same close-cropped haircuts. The guys are, from left to right, Logan Moose; Nick Davey; Tyler Temple; and Luke Pate. They came in second, by the way, but just barely!